Who will guide tomorrow’s road warriors? Looking ahead to the future of mobility, one key to capturing value could be to help individuals get more value out of mobility by serving as trusted advisers—on matters ranging from where to go to how to get there and even whom to take along. New technologies and new ways to connect with consumers are transforming the retail sector. To compete effectively, traditional retailers should reimagine how they create and capture value, thinking past omnichannel positioning to find the best uses for their assets. The Affordable Care Act has disrupted the US health care market’s current fee-for-service economic model. Out of this disruption may emerge an open, consumer-driven health care ecosystem focused on transparency, actionable insights, collaboration, and engagement. By cultivating the traits of worker passion in their workforce, organizations can make sustained performance gains and develop the resilience they need to withstand continuous market challenges and disruptions. What makes “making”—the next generation of inventing and do-it-yourself—worth paying attention to? The platforms for learning, sharing and selling employed by the Maker Movement are amplifying that impact and leading to new possibilities for innovation in products, materials and business models. Declining return on assets (ROA) doesn’t fit with the stories commonly reported about firm performance and the business environment. Exponentially advancing digital technologies have led to exponentially accelerating innovation, making the environment increasingly difficult to navigate—but also opening the door to opportunity. By adopting new ways of working focused on eliciting and amplifying the passion of certain workers, organizations will benefit from the sustained performance improvement that these individuals create. 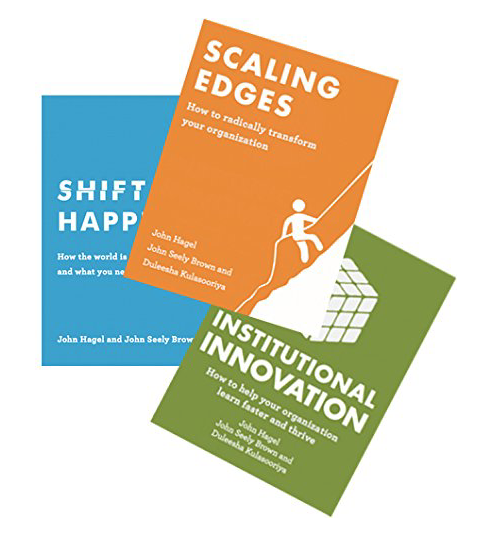 Institutional innovation allows organizations to rearchitect themselves to scale learning and generate richer innovations at other levels, including products, business models, and management systems. Resistance to change can doom organizational transformation. One way to make success more likely is through a series of small moves, smartly made—following Pragmatic Pathways to long-term change. Companies operate within ecosystems to deliver value to their markets — no company is an island. Yet, for many, these ecosystems have evolved without much attention or planning. Few companies have systematically assessed the different options available in terms of types of ecosystems. Learn how to take a more thoughtful and planned approach to this increasingly important issue. To thrive in the Big Shift, companies must move from innovating at a product or service level to innovating across their entire institutions. Unfortunately, traditional large-scale change efforts that challenge the core of the business often fail. Change management is not rational—it is intensely political. The Scaling Edges methodology helps businesses focus on low investment, high-growth-potential opportunities—“edges”—with fundamentally different business practices that can ultimately transform the core of the organization.